Use smoke machine to create smoke to be contained in a glass container. Alternatively use a culinary torch to torch oak wood chips and capture gas within a glass container/jar. 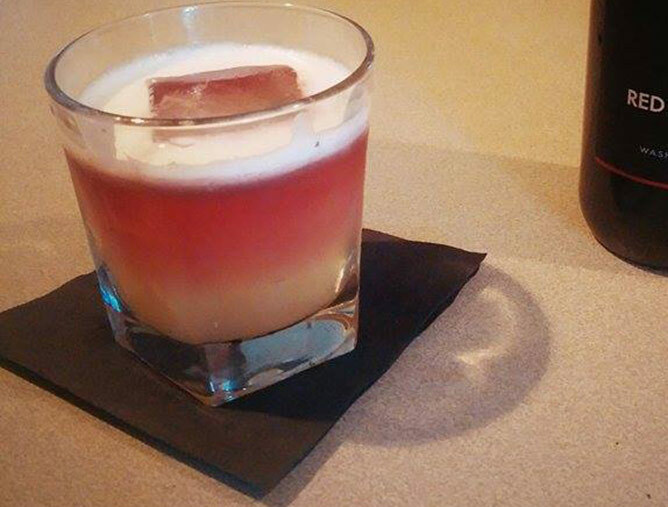 Combine bourbon, yuzu juice, simple syrup, and egg white in a shaker tin. Dry Shake without ice to create a foam head. Add ice and shake and strain into container of oak smoke. Shake glass container twice to combine the smoke and the cocktail. Pour cocktail from glass container into a rocks glass with large ice cube and Float Red Diamond Merlot on top.